A stroke physician and assistants performed a transcranial duplex. Egypt has the 15th largest population in the world, with approximately one-quarter of its citizens clustered in its capital, Cairo. Stroke medicine in Egypt has been facing many difficulties with implementation due to the economic problems and an inadequate number of stroke neurologists. 2 million people per year, half of which are served in the emergency department. The first stroke unit was established over 20 years ago, but could not satisfy the need due to the rapidly growing population and difficulties with the insurance system. The plan for a new stroke center was then created with great ambitions of going beyond offering medical services to providing stroke training and research opportunities to Egyptian, African, and Middle Eastern neurologists and to help raise community awareness. Over the years, the neurology department has sent many of its young members to European stroke centers, through grants, to be trained on modern stroke medicine together with in-house training on advanced life support and neurocritical care skills. Today, these neurologists have become the core of the new stroke unit and trainers to their younger colleagues. The stroke team, including stroke nurses and administrative personnel. In 2010, the hospital administration granted the place and funds to establish the new stroke unit. Due to the political circumstances in 2011, the project was halted until 2015, when the Kasralainy administration, led by Prof. Fathy Khodair, dean of the medical school, showed a great interest and determination to fulfill the project. In August 2016, the stroke unit was ready for a new start. The new stroke unit has a capacity of 36 beds, which includes 14 intensive care (with ventilation capability), 14 intermediate care, four isolation, two thrombolytic therapy, and two resuscitation beds, with the capacity of providing thrombolytic stroke therapy concurrently for four or more patients. This makes the unit the largest high-dependency stroke unit in the Middle East fully run by neurologists, offering thrombolytic therapy and thrombectomy to all Egyptians free of charges. The unit provides advanced acute stroke treatment services, including neurosurgery, neurointervention, advanced neuroimaging, and neuro-rehabilitation for 1,500-2,000 patients per year. The Kasralainy Medical School stroke unit. 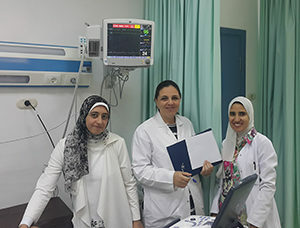 The opening of the new stroke unit received another boost thanks to the new policy on supporting and promoting stroke medicine, together with the efforts of the Stroke Chapter of the Egyptian Society of Neurology, Psychiatry, and Neurosurgery to coordinate between stroke units on a national level and promote the use of guidelines and hospital-based registries. 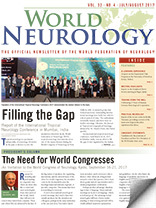 The training and research opportunities are further supported and extended by the WFN accreditation of the neurology department at Cairo University as a training center for English-speaking African neurologists. The ongoing “revolution” of stroke medicine in Egypt has made the floor ready for great success for the new stroke treatment policy, with a better acute stroke treatment service and reduction of the national and regional burden of stroke. The new Kasralainy stroke unit is ready to play its leading role. Prof. Ahmed Abdelalim is the director of the Stroke Unit, Faculty of Medicine at Cairo University.